I have a working eMac logic board from a CRT-dead unit, loaded with 1 Gig of RAM, 80 Gb HD and Pioneer DVR-105 DVD recorder. I'm planning on using it to build a file server-desktop computer, but I need the info on how to power it up. I've been looking all around the web for info and ideas on how to provide current to the mobo. The other day I found a web page that performs a technically wonderfull iMac ATX conversion (http://www.ct-scan.com/iMacATX/). 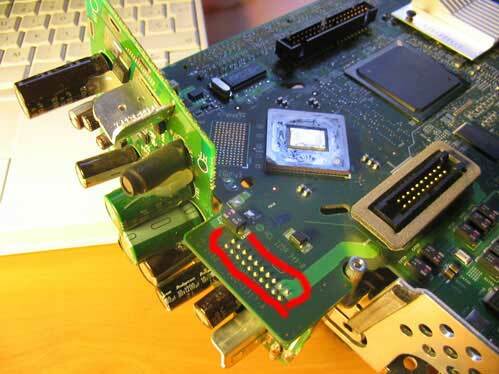 Before finding this web page, I thought the eMac motherboard SHOULD be powered through the "Blind-Mate" connectors available in the logic board, so the down converter board should make it's work of providing the necesary current to each part of the logic board (including both drives power headers). This led me to the problem on HOW to measure voltages in both "Blind-Mate" connectors (only one in 2nd and 3rd generation eMacs) without the Analog Module (I don't have it). NOW, after seeing this iMac ATX conversion, the idea is to power the logic board directly through the Down Converter Board's connector, which is the path followed by the author of this web page. The IMAC down converter board connector has 24 pins, all ordered and compared to its ATX counterpart in the diagram available in the web page, BUT the EMAC down converter board has 20 pins, and this is where I have problems when assigning each pin with its ATX counterpart. Now, I'm BEGGING anyone who could have access to an eMac (better if is a 1st generation one), to measure each pin voltage in the Down Converter Board connector, and post this info, because this is the only thing that stops me from using a wonderfull eMac system with an ATX PSU. I have a working eMac 733Mhz from 2002 and the monitor is begining to go. I can try and help, but please send me instructions on exactly what I need to do. I am a novice at computers work, so the more detail the better. I have just seen your message right now. At this moment it's 01:00 AM in Spain, so tomorrow morning I'll write a good guide to let you know what is necessary to make the eMac work without monitor and, if you want in a future, change it internally to accomodate a TFT and more drives. hi, lbodnar, pleased to meet you again here (saw you in macrumors). Great job with your eMac 800-->1333 conversion and for your last project, I'm really impressed. I really don't understand your question, which part of the logic board (or is it the Down Converter Board (DCB from now on)) do you want me to scan? And why, because as far as I know we have different versions of eMac (me 1st-slow, you 2nd-best to date). Well, really the reason is not important and I'll post this Hi-Res scan as soon as you tell me which piece of logic board you want me to scan. If it is related with the internal video connection I'm really interested on the way you did it, because on macrumors you don't explain it too clearly: do you connect wires to the video connector &/or blindmate connector? and how? This video information is important for me as I think 1G eMac has a similar video connector (mine 18 pins, with 2 indicated as NV_HSYNC, NV_VSYNC). Hi netjosh, I have basically reverse-engineered the downcoverter board (DCB) because measuring voltages does not give you an understanding of how it works or even whether they are going from or to the logic board (LB). Also you cannot separate high current and control signals. I believe G2 eMac DCB is much more complicated than the one in G1 at least from the pictures but it was vital to understand which how voltages are converted from each other. I have a strong feeling that it is easier to keep DCB as it is or repair it if it is simple enough. That will automatically take care of voltage on sequences, current protection and non-standard supplies like 2.5V. It is also part of power management process like falling asleep and switching on which is very practical to have. Anyway, I'd love to look at those DCB images first! G2 only gets video off a small connector on the bottom of the board, not blind-mate side. I have posted a photo of a converter standard VGA <-> internal VGA there but I will put them all into my image gallery here too. Can you get me a closeup of the internal video cable that plugs into it as well? I'll try to match wire colours. Great idea to keep the DCB, as you just have to connect +20V to the Blind Mate Connector and the computer will work feeded through the DCB. I don't have a good scanner on hand, but I have just taken a good bunch of 7.1 Megapixel images that I think are good enough. If you find anything interesting about this DCB or the way it could be feeded through the Blind-Mate connector, please tell me, as I'm still waiting for someone to give me this information. Another thing, how did you measure the Blind-Mate connector voltages? I want to know it because FuturamaFrye (who has written in this forum) is interested in helping measuring these voltages on a 1G eMac, and it would be just the final step to make my project work and to publish a guide similar to yours but specialized on 1G emacs. About the video cable, I don't have it, so I can only show you a pic of the motherboard connector, which is just beetween the nvidia chip and the external video connector, could you (futuramaFry) post it?. You can see from there what are the inputs and outputs and trace most of them with ohmmeter. If you want an easy way, trace input voltage pins and just feed it with some 10-20V off a wall wart, measure outputs and see how control signals are controlling them. If only I had that DC board I could do it an an hour or so. I've got a question: which are the pins of the DCB where I should connect 10-20V to measure all in-out voltages? could yo do it for me if I send you the DCB? You'd have it in England (which is where you are, isn't it?) on wednesday-thursday. You'd be of great help, because I don't know much of electricity-electronics, just a lot of computers..
Actually the board seems to be simpler than G2. So maybe the solution will be more similar to CRT iMacs. No problem, contact me at LBodnar @ dsl . pipex . com if you wish. I have sent you a private message with my address. Hows the progress on modding your eMac? If its a success please let me know because I am intresed in modding my eMac as well. Hows the progress on modding your eMac? It runs great! I just cannot find proper case for it. Apart from that - it is fully usable system. Which eMac do you have? I've just sent you my 1st generation eMac Down Converter Board and, along with it, the Logic Board, 128 Mb SDRAM, CPU Heatspreader and both drive's power cables, which connect to the logic board (nearly a full computer :-)). I've sent you the logic board to let you test it power up with the DCB attached to it (or at least identify voltages on the DCB so I can make a try at powering it up later), and both drive's power cables, which would be good to help you measure if there's any current flowing through +12V and +5V lines traced in the logic board. It will arrive at the end of this week, so I hope that you find a way to power it up. Mine is a 733 Mhz from Jan 2003, I think it is 2nd Generation. Are you sure you have 733MHz and not 700? So I think it must be a 1st Gen, but 2.1 version. I have received your eMac parts! It is really amazing how much 2 gen eMac has been simplified compared to 1 gen! Anyway, I have looked at DCB, it supplies +2.5V, +3.3V and +5V to the logic board. But +12V, firewire and CPU power (around 12V) is provided via one of the blind-mate connectors. I have a strong feeling that the second blind-mate connector used purely for speakers, mic, power LED and fan links, however I may be mistaken. I still cannot identify a couple of voltages and control signals on the first blindmate connector, I guess one of them should be trickle 5V, the rest I am not sure yet. If not that 2.5V we could have got rid of DCB but it looks like it has to stay at least for the moment. Most probably it is CPU revision. It can be read from one of the CPU registers and often reported by ASP and Xbench. Really it's a great job you've made with the logic board. The other day, when packing the logic board, I thought that the first blind-mate connector (closer to CPU) should receive main current for CPU, video and most of the board, while the 2nd Blind-Mate connector should be to provide current to the USB, Firewire and to connect fans, led's and other things, as you've proven. Have you identified voltages for each of the (at least) 1st Blind-Mate connector, so the computer could be switched on? It would be great to have the pinouts of both Blind-Mate connectors so we could use USB & Firewire with this logic board. Whatever you do, It's been a great step forward using the eMac headless. This machine version can be what lbodnar says, the CPU revision, or probably Apple machine revision number, which changes with every new mac model. White iBooks are 3.X (my iBook G4 1G is 3.3 number). iMacs G5 are 8.X (actual is 8.1). I have finished the DCB controls. I have also tried to put it all together and start it up but I must lack few last bits of the puzzle. DCB board starts up and supplies its voltages to the logic board but apart from that there is no other activity. HDD and CD voltage gates do not open to start up the drives, CPU and GPU core voltages are zero and reset switch pull-up voltage is only 1.8V. There is full 5V on USB connectors. I assume I am missing a few voltages on the blind-mate connector. I suspect it has to have trickle 5V that keeps all the control circuit energised even when everything else is off. However I have 4 unidentified pins yet so I don't want to risk. 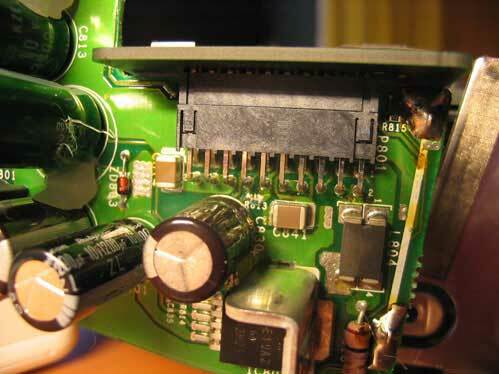 Does anybody have any extra information on or good quality pictures of 1st generation (700MHz) eMac analog board? Hey. Looks like this thread just died. Any progress made since early 2005 on this project? I have a 700 MHz eMac with a supposed fried analog board. I want to take it apart and try to use an ATX power supply and VGA monitor to revive it again. Do you still require some pictures of the disassembly? If so, what in particular do you need to see to help you? lbodnar's page that you can find details the procedure for working on the 800 MHz Generation 2 board. This thread was looking for help with getting it to work on a 700 MHz Generation 1 board. lbodnar was contributing to this thread but the last post was a long time ago and I can find no references here or elsewhere where anybody actually documented the procedure for getting the 700 board to work. Can anyone help? UPDATE: I found a french posting here http://forum.macbidouille.com/index.php?showtopic=118937 that seems to show the power supply connections for Gen 1 vs Gen 2 so I'll give it a try. It does not look like they have the video pinouts fro Gen 1 though so I can only try to see what I get out of the on board mini DVI connector or whatever it's called. I have a VGA adapter for that.